One wouldn't think it possible for sea algae to increase hair growth, but according to my supplier, Channelled Wrack (INCI: Pelvetia Canaliculata), combined with Oarweed (INCI: Laminaria Digitata) can not only increase hair growth by up to 27%, but it can (over a 2 month period) increase the number of hairs by up to 10%. And, before you get too excited, don't expect that it can just keep on and on until you have a major-sized wig on your head. It will, however, help to optimize your own hair-growing potential and then, with continued use, keep it at its best. Basically, this sea algae combo is a natural, plant-based remedy for hair thinning and hair loss that really works. Isn't that just the coolest thing ever? When I started using this hair-strengthening mix a few years ago, I bought it in good faith from my (trustworthy) supplier and added it to hair products at the maximum recommended dose. Even without advanced hair-measuring equipment, there was a notable increase in my own hair – enough to where I was sold on sea algae as a hair-bulking and strengthening active ingredient. The fact that I am still using it faithfully should really be enough. But now I really want to know why it works. The claims I found on the initial search into Channelled Wrack were pretty much identical – leading me to believe that everybody is copying everybody else in their 'documented information'. The claims: Channelled Wrack contains isoflavins and has anti-oxidant properties. But how exactly is that bulking up my hair? 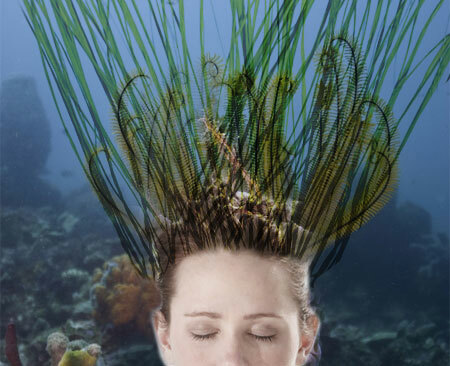 I may be searching incorrectly (it's happened – although I'm not happy about admitting it), but I'm finding absolutely no scientific studies on Pelvetia Canaliculata and its amazing abilities for hair. Weird, since I can really feel the difference on my own hair. The closest I have gotten to an explanation of how it works is this claim: Channelled Wrack inhibits testosterone-binding factors that can lead to hair loss in women. So, apparantly, it can 'mimic' hormone activity. Maybe this is why it is also such a popular ingredient in some of the commercial age-defense super creams I am seeing on the market. And, even though I still haven't found a study in my (still ongoing) search, I have run across some other interesting tidbits of info about this seaweed. grow in abundance all along the Atlantic European coastlines (all the way to Iceland). It's a cheap and plentiful product. The other magic sea algae ingredient that loves human scalps and hair by nature is commonly known as Oarweed (INCI: Laminaria Digitatis). A member of the kelp family, Oarweed has a slew of minerals, potassium, magnesium, calcium and iron, as well as vitamins A, B3, B6, B12, C and E.
Oarweed even functions as a natural cleanser because of a built-in ability to bind oils and dirt. Its content of fucoidan (a sulphated polysaccharide) makes it a popular ingredient for dietary supplements, performing as a potential viral inhibitor. Check the INCI name of the Oarweed and you will know what a laminaria stick is made of. More interesting is what it can do: help deliver babies by dialating the cervix. A laminaria stick (or a couple of them) is (are) inserted into the cervix and will slowly absorb moisture and expand, assisting the labor process. This effective method – still used today – has been around for over 100 years. What Else is Good For Hair? Below is a short-list of additional extras I use in my hair care products that I have written about on this blog. What's in Shampoo - Should We Care? Hi, can I buy the sea algae extract from you or can you tell me where to get it from? Hey there Anon! I don't sell ingredients, but if you check the sidebar on the blog, you'll find a list of links - these are to cosmetics ingredients suppliers around the world. I am pretty sure most of them carry the sea algae. Best of luck with it! Do you have the link you bought your sea algae from? Also, have you worked with maca root which is purported by Aromazone for hair growth? I've never worked with Maca root, but am of course now curioous to give it a try. the sea algae was purchased from Aromantic in the UK. Check the sidebar (not viewable in mobile version) for links. Hello, I am unable to find the links in the side bar to buy the algae. Could you please reply with the links or give me some directions :D.
"When I started using this hair-strengthening mix a few years ago, I bought it in good faith from my (trustworthy) supplier and added it to hair products at the maximum recommended dose." Can i ask specifically how you used the sea algae in your hair products. I am interested in creating a diy and don't know how in which form i can use the algae. Hey there FirstTimeFalling - I think the supplier I used at the time I wrote this post has stopped carrying this item. If you google channeled wrack and oarweed you may find providers of these 2 ingredients and make your own blend. You'll have to ask your supplier about usage/dosage for each item as it will depend on whether or not you find the items as dried powder or in some kind of tincture or extract. Best of luck! Chemical Free? Give Your Head a Shake!